This infographic, in a nutshell, tells you that it takes your whole life to become a doctor – but in a good way. It shows the development of the brain, salaries of doctors compared to other professions, gender roles, stress, reward, and the top 20 countries by the number of doctors they have. Along the left side, there is a timeline of ages, telling you at what age you complete certain stages you go through to become a doctor. We’ll split the review and overview into the first sections we mentioned, and then explain the timeline. The left brain helps a doctor make decisions, including suggestions for treatment, diagnoses, and problem solving, as well as remembering codes and drug information. The left brain helps a doctor stay on schedule, understand medical charts and test results, and give patients advice about preventative healthcare, diet, and hygiene. The right brain helps the doctor with bedside manner, allowing him or her to be personable and charismatic. It also helps the doctor with coping skills, since he or she will deal with death, illness, and injuries. The right brain equips the doctor with emergency handling skills, helps the doctor recognize human anatomy, deal with a chaotic working environment, and allows the doctor to feel empathy for his or her patient. Salary vs. Jobs in the U.S.A. This graph shows the salary and amount of jobs for certain professions in the year 2008. In that year, there were 661,400 physicians and surgeons, with a median salary of $186,044. Conversely, there were 1,700,000 professors with a median salary of $58,830. Several other occupations are listed. Colon and Rectal surgery is a growing field for female doctors because surgeries can be scheduled in advance, allowing for flexible scheduling and a work/life balance. In 2007, 31% of colon and rectal surgeons were females under the age of 35. 12% were females between the ages of 45 and 54, and 3% were females between the ages of 55-64, making females of any age 45% of colon and rectal surgeons. Today, 40% of doctors are women, and it is estimated that within 8 years, female doctors will outnumber male doctors. 43% of physicians and surgeons work more than 50 hours per week. 17% of doctors leave medicine in the middle of their careers. 36% of surgeons feel they have no family time, yet 51% would want their children to follow in their footsteps, career-wise. Must be the money. Helping people can be the greatest reward. High-paying job aside, doctors are able to help people in ways that other people can’t, by healing. They can remove tumors, fix organs, and help people recover from grave injuries and illnesses. 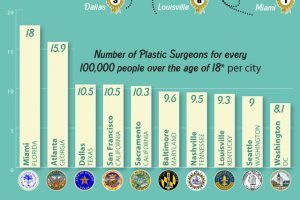 China has the most physicians at over 1.8 million. The U.S. comes in next with 730,801 physicians. The order then goes to India, then to Russia, Germany, Japan, Italy, France, Brazil, Mexico, Egypt, Ukraine, Spain, U.K., Pakistan, Turkey, Argentina, Philippines, Poland, and Korea. It’s clean, the colors are nice, and the typeface is easy to read. The graphics are easy to understand, and it’s overall a very good-looking infographic. I would have liked to have seen more recent data than 2008, but it’s not always available. I would have also liked some statistics regarding the “reward” section as it seems a little subjective. Maybe a little graph that shows what a sample number of doctors rate as their favorite thing about their job, or something. 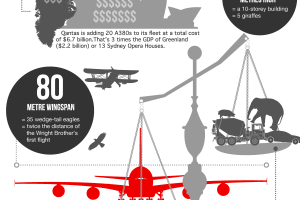 Howard Hughes – Infographic or Timeline?